Samsung is now offering $150 off the unlocked Galaxy S8, and you can get another $150 off when you trade in a qualifying smartphone. You can view the Galaxy S8 deal on Samsung’s website. The devices that qualify for trade in are the Galaxy Note 5, Galaxy S6, Galaxy S6 edge and S6 edge+, Galaxy S7 and Galaxy S7 edge, iPhone 6s and 6s Plus, and iPhone 7 and iPhone 7 Plus. Samsung says that your trade-in device must be in good condition, which means that it needs to power on, hold a charge, have a working display, have no breaks or cracks, and not be on a blacklist. This deal applies to the T-Mobile versions of the Galaxy S8 and Galaxy S8+, which cost $750 and $850, respectively. 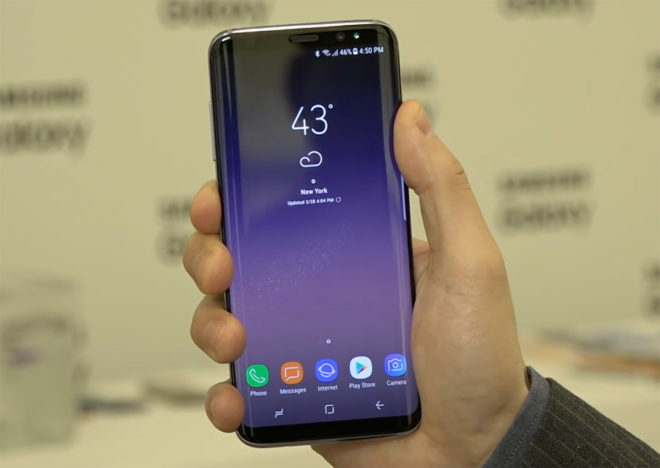 It also appears to qualify for the other carrier versions of the GS8 and the unlocked models, but do note that in order to qualify for this promotion, both phones must be on the same carrier. Samsung says this deal will be available for a limited time. Wait. So up to 300 off ? Yeah – They’re offering $150 off to everyone – and then it offered me an additional $150 to trade in my GS6. Seriously! I really hope no one would ever do that! I started laighing when I saw that a 5s and a 7 plus command equal trade value! The devices must be in good condition (meaning it powers on and holds a charge; has a functioning display; has no breaks or cracks or other visible defects that go beyond normal wear and tear; and is not on a black list of any kind) to be eligible for Trade-In. Prior to trading in device, you must perform a factory reset and remove all personal information from device and eligible devices must have reactivation lock, Google Factory Reset Protection and all other anti-theft locking software disabled. Devices not meeting these criteria will not qualify for the trade-in program. Im trading in a 5s… the 150 applies woohoo! Im getting the unlocked version, comes out cheaper than the Sprint model. I used a nexus to sign up for sprint free for a year, which was an eligible device for byod. Im jist hoping sprint doesnt give me grief about swapping phones with the s8. Now ill have Tmo a d Sprint well for a year… taxes are pretty much the only price im willing to pay for sprint lol…atleast its been filling a couple gaps i had with tmo in the train stations. Anybody know if the unlocked version is compatible with T-mobile’s HD voice? I have an old iphone 5 I would love to send it for this deal. , No scratches whatsover , everything works like it used to. However the on off button doesn’t work, so you can’t turn it off. I am kind of afraid to send it in because the terms it state that if they deem your trade in isn’t worth 150, they can charge what they put a value and -$25 and charge you extra, plus they don’t have to to send your old phone back to you. What do you guys think? Id say risk it bc ud get like almost nothing anywhere else trading it in! Does your trade in have to be completely paid off or unlocked?